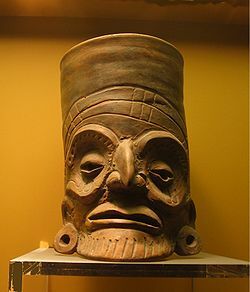 A rather expressive orange-ware clay vessel in the Toltec style. Toltec is used by historians in different ways. It is either used to refer to certain people that lived in what is Mexico today, before Christopher Columbus came there. Some scholars also use the word to refer to the people that later developed into the Aztec civilisation. These people are only known from Aztec stories. It is not known if they actually formed one people or not. ↑ For other Toltec artifacts from the American Museum of Natural History collection, click here. This page was last changed on 9 March 2013, at 10:10.